Greywaren Art: You gotta have goals. 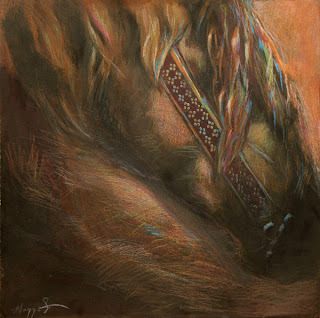 "Memory" - 16 x 16" colored pencil on board. Regular readers will know that I am in love with goals. If goals were a vegetable, I would pick bushels of them, eat them until I was sick, and then freeze the rest so that I could have a continuous supply of goals through the cold months. One thing I have learned about goals, however, is that, like vegetables, if you don’t use ‘em or freeze ‘em right away, they go bad. Some of them go bad in a spectacular fashion. Like if you vow to lose 20 pounds at the beginning of the year, forget about the goal, and then discover Haagen-Daas ice cream sometime in June . . . not only is that goal to lose weight gone bad, but it’s bad like stinking in the bottom of your crisper drawer bad. With rotten goal juice eeking around it. And other goals go bad in a sort of failure to stay relevant way. Like if you suddenly crave sweet potatoes and buy a ton of them. If you don’t cook all of them, you’ll have those few lonely ones left over. They’ll never go bad in a fantastically awful way, but you’ll end up throwing them away after eight months because you just don’t want them anymore. So goals should be checked often and the ones that are really timely ought to be attacked immediately. So enough with the metaphor. I wanted to write a post today about New Year’s Resolutions. Stop staring at the screen like that, it’s rude. I know it’s nearly the end of July (yes, it’s nearly the end. The 21st. Can you believe it?) but they’re still a good topic. Because halfway through the year(ish) is a great time to pull out your Resolutions and see which of them are done, which of them are so irrelevant you’ll never truthfully attempt them, and which of them are oozing stink-juice in your veggie drawer. Here’s the sordid truth about New Year’s Resolutions: very rare is the resolution which actually stays good for a year. Twelve months is a long time. Priorities change, economies shift, careers jiggle, exercise goes better than planned, things get born under your porch with six limbs and eyes that glow red faintly in the darkness. It just makes good sense to reevaluate your goals partway through the year to make sure they’re still functioning the way they’re supposed to. Here are my New Year’s Resolutions I made at the beginning of the year. Let me show y’all how I’m changing them to make them fit my changing priorities (without welching on any of them). 3. make x amount of that with prints. 4. Contract for sequel to Lament. 9. Record a lament for Lament. 11. Contract for one other book. I've managed to accomplish #1, 2, 3, 4, 7, 10, and 11. Instead of just crossing them off the list, I’m revising them. NEW 1. Establish a solid financial plan for the next two years. (See how this is related to my first three goals I accomplished? NEW 10. Keep my novel website updated regularly. Now for the ones I haven't done yet. Two stay as they are: I'm still going to NYC and I'm still going to record the lament -- I've written it, I just need to make it into the studio. But two need to be changed. I didn’t do #5. I’ll confess, I let these two musical pieces sort of go stale next to my potatoes. I had thought I’d be playing my harp more, but really I’ve been working with my acoustic guitar more as the harp needs new strings. So I’m changing #5 to something that will actually have meaning on the list: Buy an electric guitar for my birthday in November and start to learn some fun tricks on it. And I worked diligently on #8, running a mile, until it got hot – really hot – and then I decided that I really needed something that I could do indoors. I’ve been dying to get killer abs, so I switched this to sit-ups instead. (and whoo do I see a difference . . . you could throw bricks at me now and my abs would repel them). Anyway, so my new number 8 is to do sit ups three times a week for the rest of the year. Still fitness related. But totally air conditioned. Go on, call me a wuss . . . So how about you guys? Have you revamped your goals yet? Do you need to? Heh, I'm sorry to say that after bugging you about your New Years goals I never acually sat down a tweeked mine...know what? I'll do it right now! Super post Maggie, I think a mid-year review of goals is a great idea. I must admit that I've tweaked mine as the year has progressed (and due to some unforseen circumstances) and I suspect that before the year is out I'll have altered them a bit more. I love the equine piece too, what great colours and atmosphere and the cropping makes it really eye catching! I am a goal lover like you, so this is very uncommom for me. Just goes to show we all occassionally fall off the goal wagon. I'll be finding and reviewing those goals today! Becca - that's okay, you inspired me to post about it! Rita -- thanks for the nice comments on the art (it was challenging because we had to stick to the color/ value pattern of the mosaic tile we were assigned. Love your icon! Stacy -- I just visited your blog and I think you have an excuse for being distracted!